1. Hunger remains the No.1 cause of death in the world. Aids, Cancer etc. follow. 2. There are 820 million chronically hungry people in the world. 3. 1/3rd of the worldÂ’s hungry live in India. 4. 836 million Indians survive on less than Rs. 20 (less than half-a-dollar) a day. 5. Over 20 crore Indians will sleep hungry tonight. 6. 10 million people die every year of chronic hunger and hunger-related diseases. Only eight percent are the victims of hunger caused by high-profile earthquakes, floods, droughts and wars. 7. India has 212 million undernourished people – only marginally below the 215 million estimated for 1990–92. 8. 99% of the 1000 Adivasi households from 40 villages in the two states, who comprised the total sample, experienced chronic hunger (unable to get two square meals, or at least one square meal and one poor/partial meal, on even one day in the week prior to the survey). Almost as many (24.1 per cent) had lived in conditions of semi-starvation during the previous month. 9. 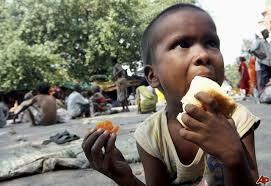 Over 7000 Indians die of hunger every day. 10. 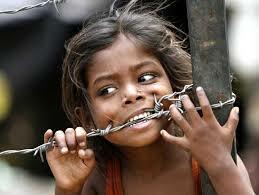 Over 25 lakh Indians die of hunger every year. 11. Despite substantial improvement in health since independence and a growth rate of 8 percent in recent years, under-nutrition remains a silent emergency in India, with almost 50 percent of Indian children underweight and more than 70 percent of the women and children with serious nutritional deficiencies as anemia. 12. The 1998 – 99 Indian survey shows 57 percent of the children aged 0 – 3 years to be either severely or moderately stunted and/or underweight. 13. During 2006 – 2007, malnutrition contributed to seven million Indian children dying, nearly two million before the age of one. 14. 30% of newborn are of low birth weight, 56% of married women are anaemic and 79% of children age 6-35 months are anaemic. 15. The number of hungry people in India is always more than the number of people below official poverty line (while around 37% of rural households were below the poverty line in 1993-94, 80% of households suffered under nutrition).